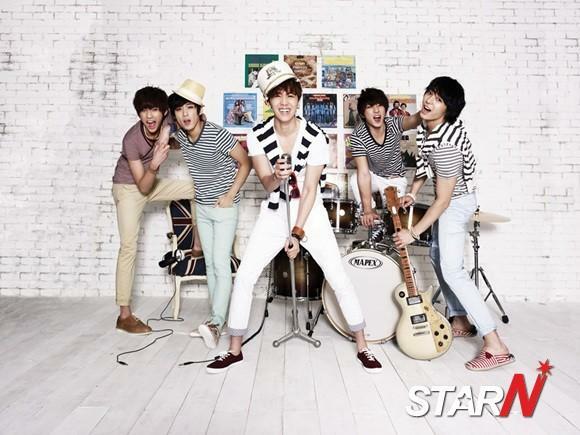 FT Island is having summer tour 'FT ISLAND Summer Tour 2012 RUN! RUN! RUN!' in Japan this summer. The tour will be held from June 24th to July 8th, and FT Island will be having five concerts in four different cities, including Tokyo, Osaka, Nagoya, and Fukui. Approximately 60 thousand crowds are expected to gather, and it will be the biggest tour that FT Island has ever done. The popularity of FT Island is continuously growing after their debut in Japan in 2010, and people are paying close attention to their new summer tour. Previously, their first Japanese album 'Five Treasure Islands' was ranked 1st in Oricon Weekly Chart, and their first solo concert tickets were sold out in less than 2 minutes. Furthermore, their concert in Yokohama Arena tickets were sold out in one minute, further indicating their hot popularity in Japan. On the other hand, their second Japanese album '20' will be released on May 16th.